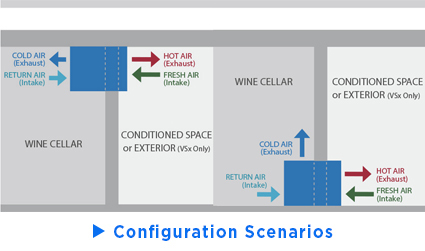 CellarPro's 4200VSi-AV cooling unit has been optimized to provide consistent, cool conditions for Audio-Visual equipment storage rooms. AV equipment often creates heat that must be managed in order to avoid damaging expensive electronic components. Our 4200VSi-AV audio-visual system is designed to generate 5265 BTUH and maintain 75F in conditioned environments below 40% RH. Please note: This unit is subject to a 5-20% BTUH correction factor above 40% relative humidity. Ambient relative humidities greater than 60% exceed the design limits of this cooling system. Visit our Learning Center for data tables, performance charts and product comparisons among different brands. 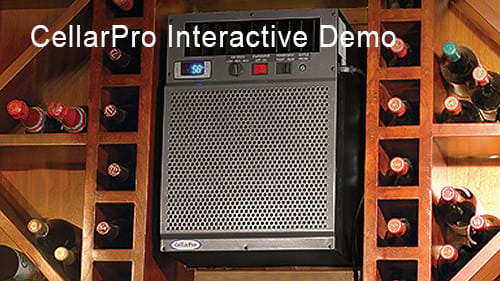 CellarPro 4200VSi-AV units are self-enclosed, fully-charged units designed to be installed through-the-wall and sized to fit in between standard wall studs. 4200VSi-AV units also can be located remotely from the cellar with the addition of one of our front duct packages. Offered with or without insulated flex ducting, in a choice of configurations for low or high humidity conditions, our front duct packages allow these cooling units to be ducted up to 50 equivalent feet away from the cellar and requires 8-inch (or greater) ducting from start to finish. 4200VSi-AV units require fresh air intake at the rear of the cooling unit. If sufficient space does not exist to provide sufficient airflow to the rear of the cooling unit, you may need our rear duct kit. For installation in environments below 40F, 4200VSi-AV units require our Compressor Heater (P/N 1727) . CellarPro 4200VSi-AV Cooling Unit (P/N 2181). CellarPro's 4200VSi-AV cooling unit is engineered to maintain ideal temperature conditions in Audio-Visual equipment rooms. 4200VSi-AV uses an optimized compressor and oversized coils to generate cool, consistent 75-degree temperatures with minimal noise. Designed for indoor use only, 4200VSi-AV units can operate in environments ranging from 115F to 40F out of the box. To operate the unit in colder temperatures, please see modifications listed on the Options & Upgrades tab.